Sign up and get FREE COMICS here! I am currently working on Issue #5! In the meantime, enjoy the archive! EGORAVEN IS NOW AVAILABLE ON THE WEBTOON APP! Join me on on PATREON and help me create more comics and art! Chek out my YOUTUBE page for art demo videos! 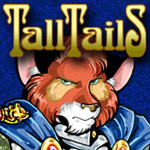 Check out my other furry adventure webcomic! Visit our MAIN CATALOG for books, comics and prints! Visit our REDBUBBLE store for everything else!